This is my first year as a full-time technology teacher but I know the struggle is real when trying to integrate technology. Time is tight and it can be a hassle at times to fit it all in! 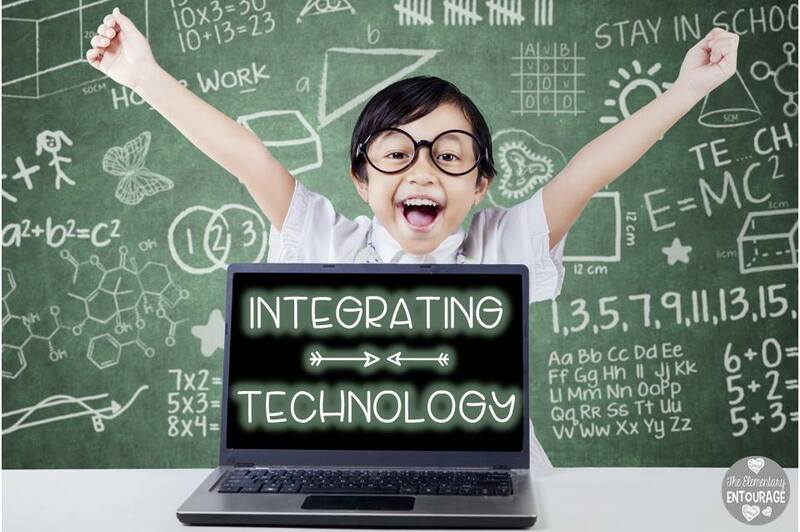 However, the best part of technology is that it is super engaging and can enhance ANY lesson. 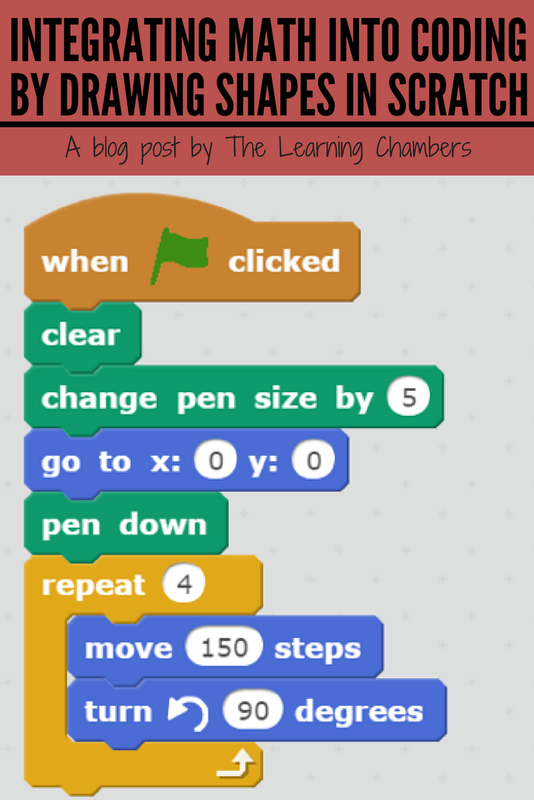 Today I want to share with you guys how to integrate coding into a math geometry lesson. 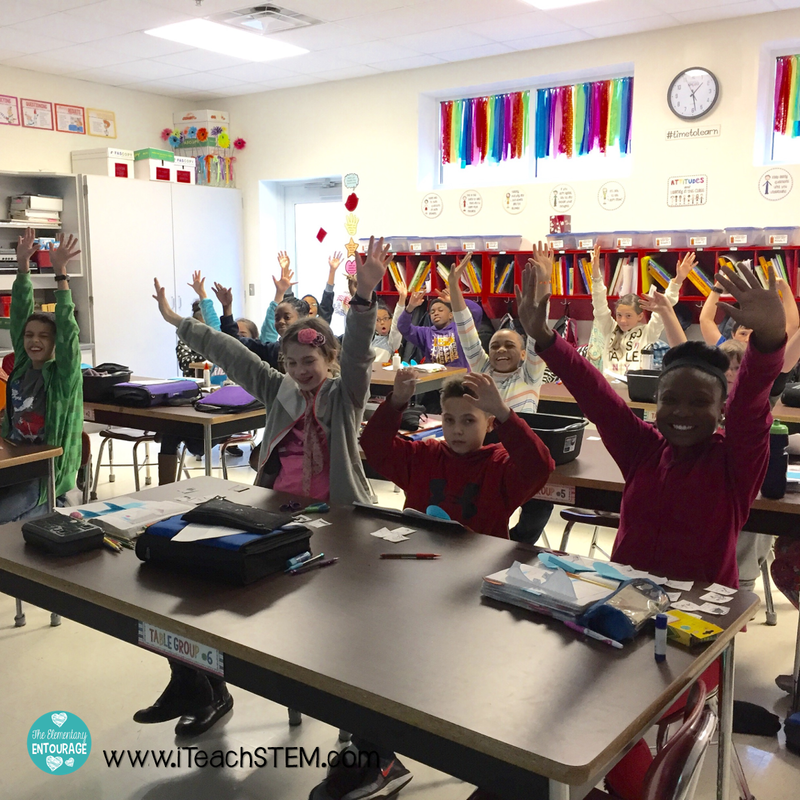 My third, fourth, and fifth graders LOVED this lesson! 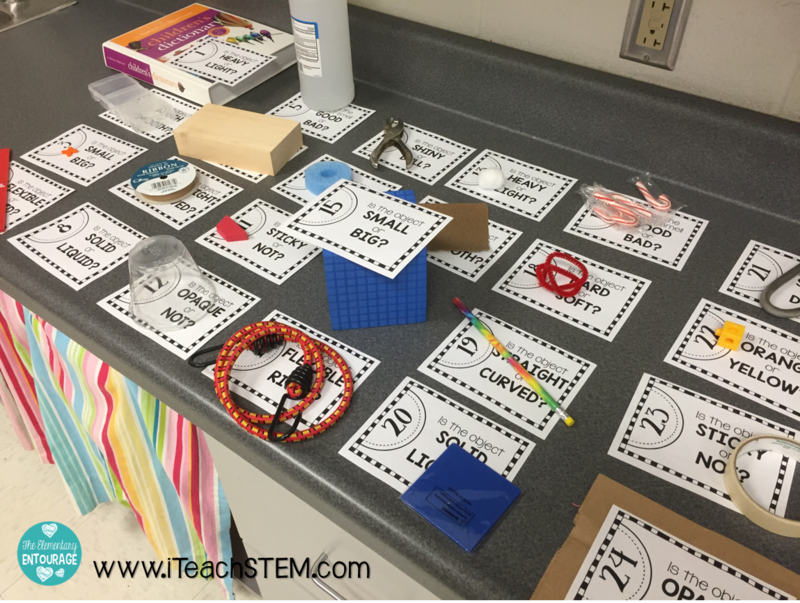 I even created a video lesson for you to share with your class! 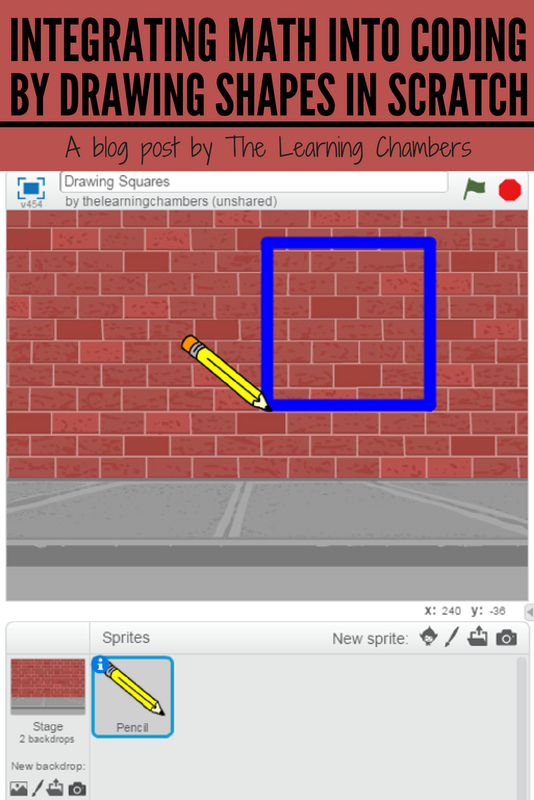 I created this lesson as an enrichment lesson to get students practicing angles, coordinates, and geometry. I decided to focus on squares and rectangles and then challenge my students to create other shapes on their own. 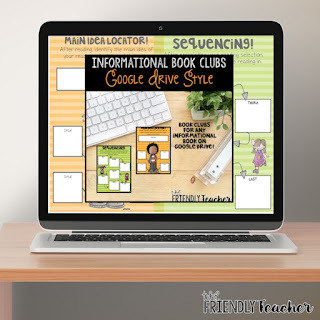 Here is the video lesson that you can share with your students. I also created a spirograph lesson that is the follow-up to this lesson. My students were super creative and created some awesome spirograph designs using shapes and angles. I will definitely create a video of that for you guys in the near future. I love using Scratch in my classroom with my students. 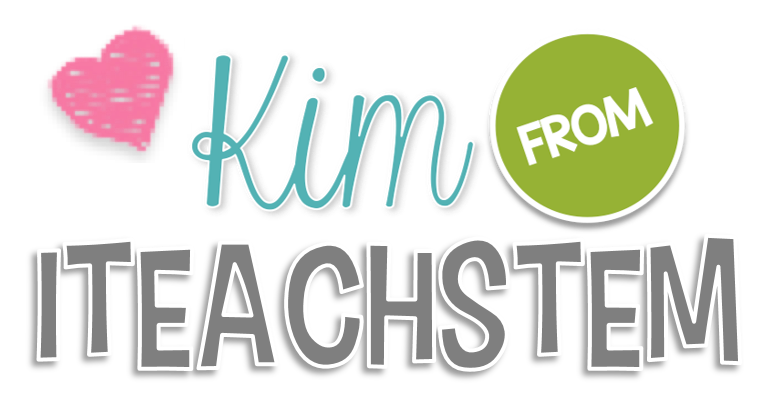 I would love to hear how you use Scratch in your classroom. 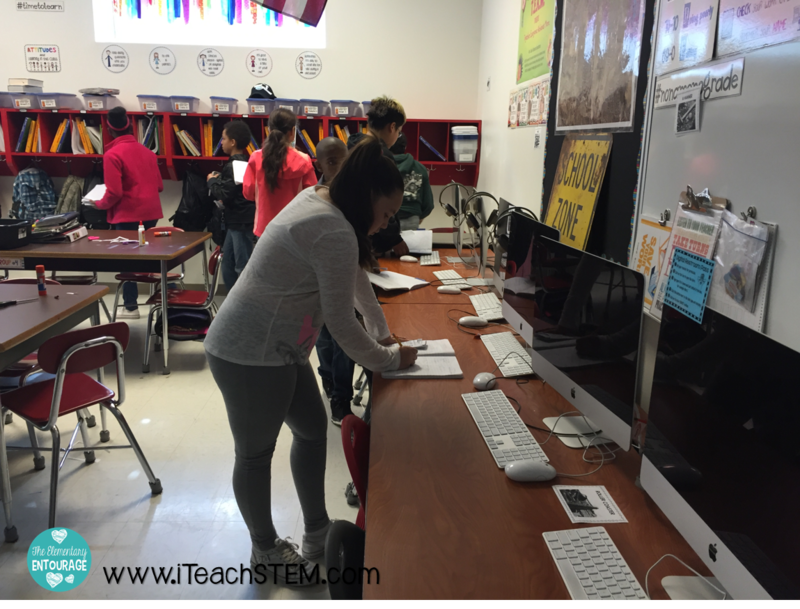 Technology is one of my absolute favorite things in the classroom. I try not to overdo it because they shouldn't be dependent on technology. 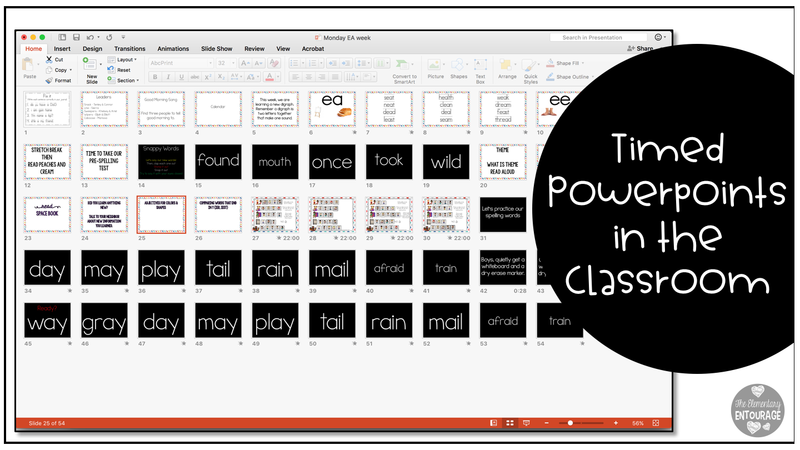 So, today I'm super stoked to bring you my TOP THREE ways to integrate technology in the classroom using powerpoints. 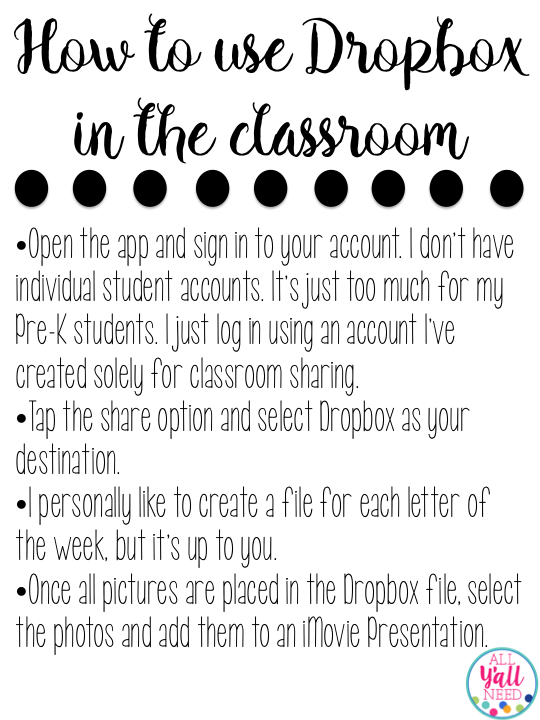 This is one of the simplest ways to incorporate a form of technology and possibly another piece of technology if you have the tools. If not, you are able to use non-technology tools. All you need is Powerpoint for this to work! My kids have LOVED every second of working with interactive powerpoints. We use them in math and in reading. This particular one was earlier in the year when we were reviewing short vowels. They had to write the beginning sounds for each picture and it reveals a secret word. We use this same method to practice our sight words, phonics skills and MORE! What's the super fun part about it? We use the Doodle Buddy app to write our words. There is something about that app that is WAY more exciting for them. We do switch it up and use whiteboards, but they really prefer this way. This is also one of my FAVES! 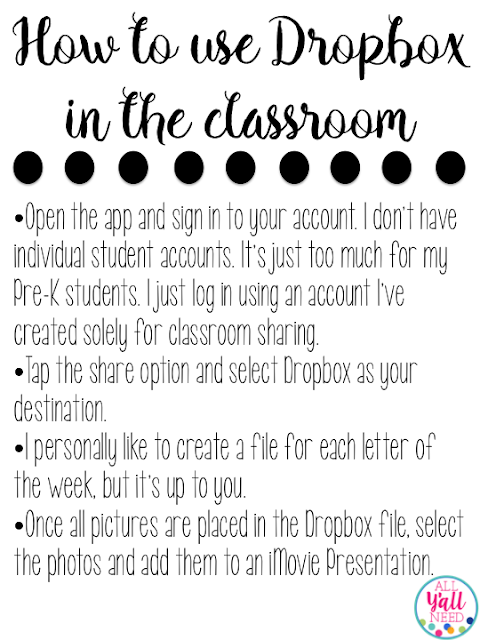 I especially love this when I have a doctor's appointment or a meeting and have a sub in my classroom. My reading block runs on a powerpoint and works like clockwork. It keeps me on track to what we should be doing. Under certain slides, I've set them to a timed transition. You can do this under the Transitions menu. Just change the time (add a sound if you'd like). I add a YEE-HAW sound. This signals that we need to clean up and then they move to their next Daily 5. It work FLAWLESSLY. I keep my group that I have for about 2 more minutes while everyone is cleaning up. That normal wasted time isn't wasted anymore because we keep working. We are usually finishing up our book/story right at the end. I know some schools do not allow teachers to add apps. In this case, you're actually in luck! 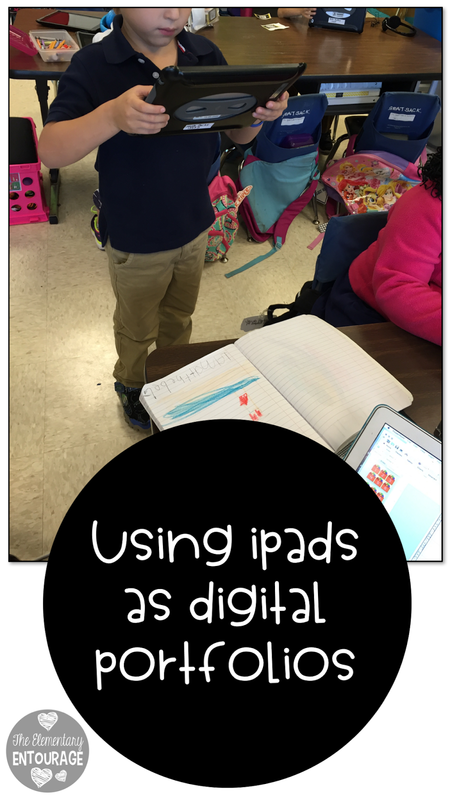 If you aren't allowed to add your own apps, you can STILL use any number of iPads in your room as a digital portfolio. 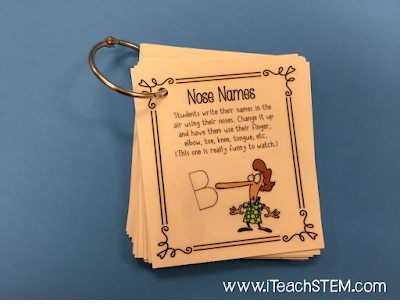 Allow your students to use something with their name on it. In the past, I used a laminated picture of them and their name. They took their "license/id" and placed it by their work. Then, they grabbed an iPad and took a picture of their work. Later, I moved their pictures into folders with all of their work. Super easy! This way, I still know who's work belonged to who and the only thing I had to do was make a card with their name and picture on it. I used their folder of pictures to use during conferences. I didn't have to keep as many hard copies of work as I've had to in the past. Incorporating more movement into your school day doesn't have to be difficult. Little changes can add up to make a big difference! 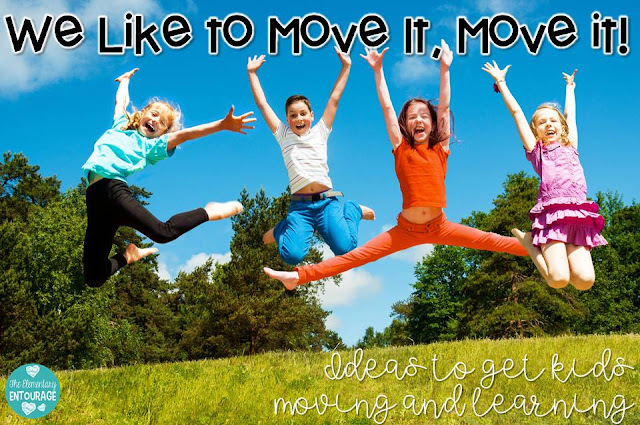 Here are 5 easy ways to get your students moving and learning! 1) North, South, East, West - This is a fun game to play while reviewing any subject. All you need is 4 walls and some multiple choice questions. Tape a sign on each wall with the correct direction. 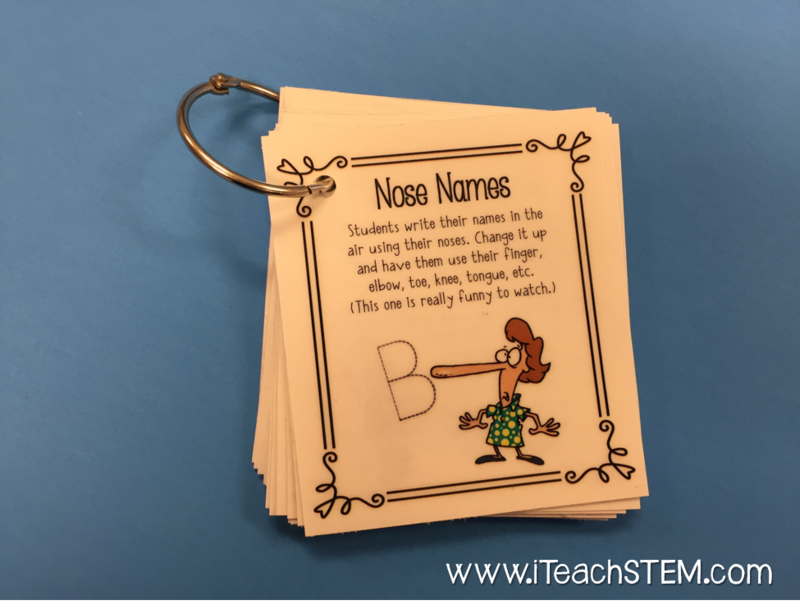 Then read a question to your students, giving the multiple choice answers as N, S, E, or W (instead of A, B, C, or D) Students then move to the correct wall to show they know the answer to the question. 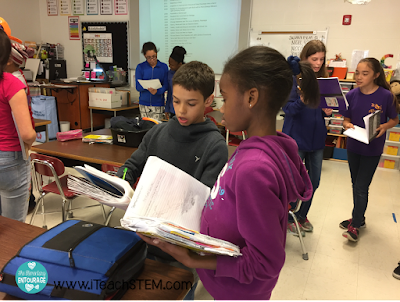 2) Vocab Match Up - Students love this game to practice vocabulary words. Use index cards and write vocab words on half of the cards and the definitions on the other half. (You can also do this with math problems, putting a math problem on half the cards and the answers on the other half.) Mix them up and pass them out. Students then walk around the room comparing cards with each other until they can find their match. Gather the cards, mix them up, and play again! 3) Move it outside - With spring approaching, now it the perfect time to get students outside! Have students bring their journals outside to complete a writing assignment, or have them do an observation of something in nature. 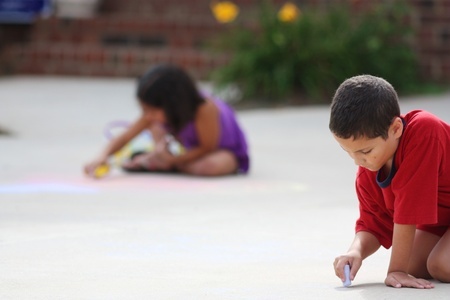 4) Sidewalk Chalk - Even older kids can have fun with sidewalk chalk! Work on math problems or spelling words outside on the sidewalk. Once I even had my class do a collaborative project where we drew a life size blue whale with chalk in the bus lane. 5) Movement Jar - Write some quick exercises on slips of paper and put them in a jar. Examples could be 10 jumping jacks, hop on one foot for 30 seconds, touch your toes 5 times, etc. During times when you are already transitioning during the day say, "Time for the movement jar!" Have a student pick from the jar and read the movement. It takes only an extra minute, but it can really help add movement throughout the day! 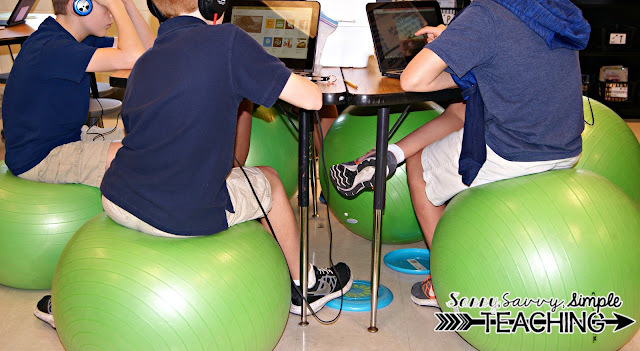 The topic of physical movement embedded in instructional settings is HUGE! The research is strong and it expands in a variety of ways. As adults, we all know we don't learn when we are sitting in lectures. So why in the world would we ever assume a young human could?!?! Currently as a 5th Grade ELA teacher in tight quarters with 50+ large bodies, I was in search of some moving / life skills to implement in my classroom. Today, I'm going to share with you how I keep the students moving in our classroom. 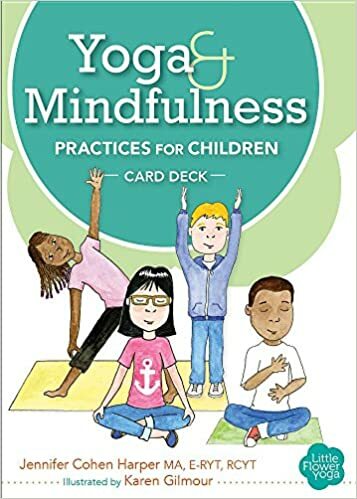 Going into my journey I was looking for a way to allow my students to move their bodies in a healthy manner that included strategies of concentration, focus, decompressing and alignment. 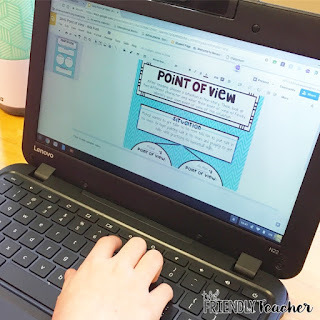 I found myself reading and researching online for solutions that would work in my classroom. I immediately started looking for more information on blood flow, oxygen flow, calorie burning, posture, body alignment, focus and concentration. 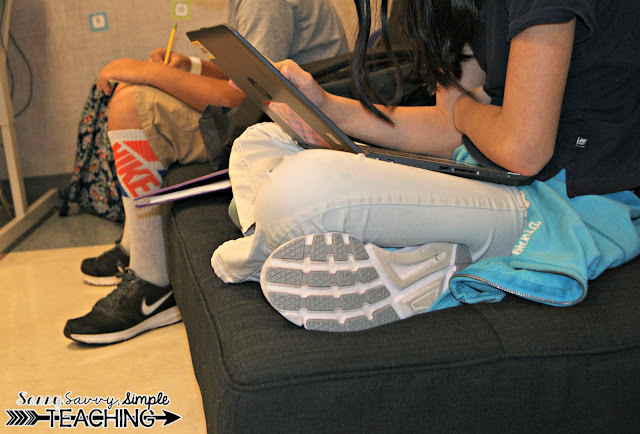 I began with a complete flexible seating classroom. 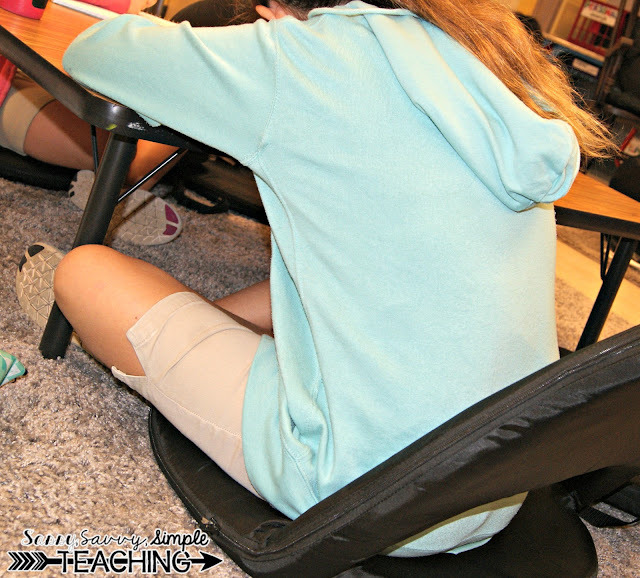 The research of alternate seating all leads to increasing consistent positive body movements which then leads to inner body functions flowing constantly which allows alertness. 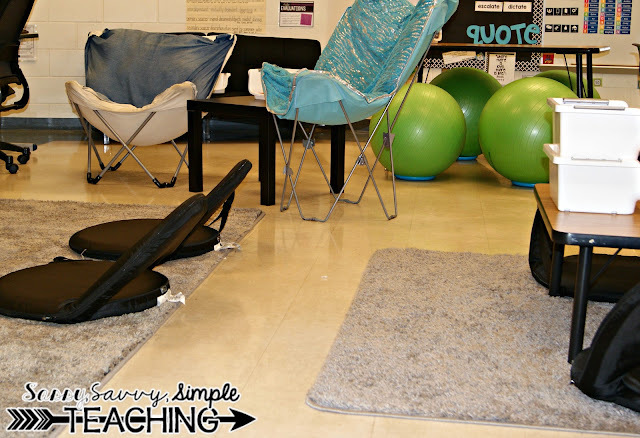 I wrote a complete blog post of how I created a budget friendly classroom transformation on my blog and the reasons why flexible seating improves inner health through the positions of your body. Then I began breathing and meditation exercises combined with yoga for our transitions between Reading and Writing. The research of breathing, meditation and yoga in schools is completely spot on in my classroom. The yoga exercises allowed my students not only to move their bodies through stretches and poses, but it also helps align the child's spine. This is a huge benefit to me as a child's spine needs to be stretched into the proper position every so often after sitting in a position for a certain period of time. Yoga poses allow for proper blood and oxygen flow through your body as the poses change in a sequence. Yoga also helps to build core strength and muscle strength in the limbs. The breathing and meditation exercises allow my students to center themselves as the day progresses. It's very important to me to teach my students life strategies that they can use beyond my classroom. This is a single time each day where my students are able to close their eyes and focus only on there own mental state. I have students with high anxiety and really bad nerves. Students need a strategy that allows them to step back, refocus and then return to a task. It helps students to be able to focus on their breath as a strategy and as an anchor to their inner-self. Here are some cards I use daily in my classroom. They allow teachers to read to the students as the meditation, breathing or yoga activity goes on. I simply play music through Pandora or Spotify. 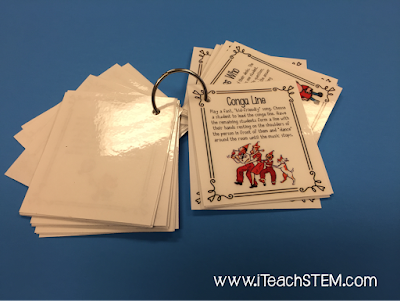 Everything in the video comes from teaching students from these cards!